Vardakeios School of Hermoupolis is operating since 1872 as an annex to the Literary Society of Athens “Parnassus” which was designed to combat illiteracy by offering free primary and vocational education. The initiative of “Parnassos” to establish a school for the primary education of poor children who worked all day for survival, gave great relief and hope to the people of Syros. The training covered the six main classes of primary school. The courses were held at night and they were aimed to young children and adolescents. The year 1888 was a milestone for the school because it started working as an independent association . Since then it`s managed by a Board of Directors which is renewed every three years and keep his statutes and budget. 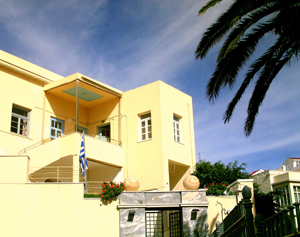 With a donation of philanthropist John Vardaka (GRD 4,000,000) in 1938 the school`s building was fully renovated and repaired. For this reason, the school was named Vardakeios Vocational and Night School of Hermoupolis.